Lily Of The Valley, a low growing plant that blooms in the early spring and has a great fragrance. The famous Orange Daylily which provides bright pops of color. We have many varieties of Trillium – a low growing native woodland wildflower that flowers in spring. Phlox, which comes in both the taller varieties and as a ground cover. We’ll ship your order fast so that you can get to planting! There are many things to take into account when planning a flower garden in your yard. Location and size are not the only issues to consider. The type of flowers to plant is an important thing to keep in mind. You could go with annuals for non-stop blooming throughout the growing season, or you could go with perennials. Perennials only need to be planted once, and you get to enjoy the beauty of their re-appearance every season. Not only does a perennial flower bed bring natural beauty to the yard, but it also attracts butterflies and hummingbirds. Perennials are an excellent choice for those that want a more permanent flower bed. These types of flowers grow back every season on their own, and each year they are more abundant in size and blooms than the year before. There are many varieties of perennials to choose. These include the sun, shade, ground cover, cut flower, small shrubs, and many more. There are even some perennials that have a Spring to Autumn blooming time such as the Garden Phlox. Flowers are not the only thing to consider when purchasing perennials. Many perennials are grown for the beauty of their variegated leaf color which can also enhance and add color to the flower bed. 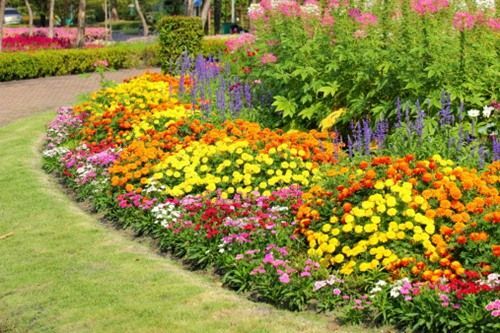 Creating an all season flower bed will provide a colorful array of flower blooms from Spring through Autumn. Some perennials, like the Bleeding Heart and Bloodroot, begin to bloom in early Spring, while others like the Asiatic Lily and Balloon Flower bloom in mid-Summer. Finally, the Aster and Black-Eyed Susan produce their flowers in Autumn. Keep this in mind while choosing the perennials and planning the bed, and you’ll have no problem at all enjoying a beautiful array of varying flowers through the entire three seasons. With all of the choices available when buying perennials, the final result of a beautiful flower bed is only limited by the imagination.